When the Patrol started in 1929 the first badges were numbered. The retiree mounted this badge on a plaque, resulting in the hole. Hat badges were numbered like the breast badges when the Patrol originated. After the first numbered badges the next order of hat badges had the letters "NC" applied to the front. The same style badge is still used today, except the letters are made into the badge. After the first breast badges were numbered on the front, the next order had numbers stamped into the back of the badge, this is one of those badges. Numbers were stamped into the back of the 2nd order of Patrol badges. 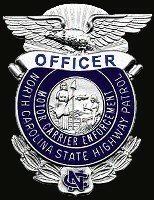 Current trooper badge introduced in the 1980's. Corporal rank badges were used from 1931 until 1968. The Hahn Badge Company manufactured the Patrol's badges from 1929 until the late 1970's, this is an older Hahn Sergeant rank badge. An older Lieutenant rank badge. 1940's issue Captain rank badge. 1940's issue Major rank badge. This silver gilded button is from the 1st uniform coat of Charter Member Arthur Welch. Blackinton Badge Company has held the contract for Patrol badges since the late 1970's. This Blackinton badge was worn by the Communications Division for a few years during the late 1970's. This Trooper of the Year medal was awarded to Patrolman C. W. Bringle in 1959. This Trooper of the Year medal was awarded to Patrolman C. W. Bringle in 1958. 2004 Motor Carrier Enforcement badge. 2004 Motor Carrier Enforcement Sergeant badge. This set of Colonel's Eagles date to the 1950's. These collar insignia were worn by the Communications Division during the 1970's. Pith Helmets were worn in the late 1940's and early 1950's during the summer. Felt Campaign Hats were discontinued during the 1980's.